The common use by archaeologists of ubiquitous technologies such as computers and digital cameras means that archaeological research projects now produce huge amounts of diverse, digital documentation. However, while the technology is available to collect this documentation, we still largely lack community-accepted dissemination channels appropriate for such torrents of data. Open Context aims to help fill this gap by providing open access data publication services for archaeology. 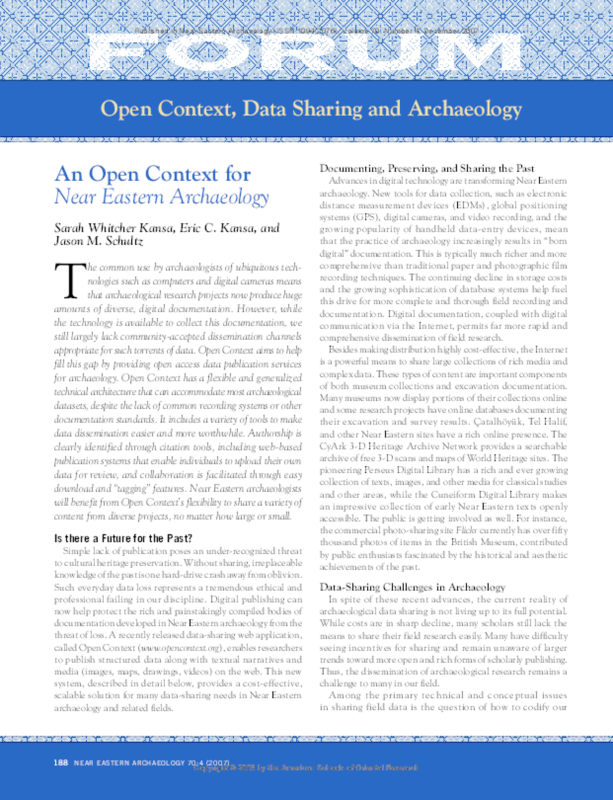 Open Context has a flexible and generalized technical architecture that can accommodate most archaeological datasets, despite the lack of common recording systems or other documentation standards. It includes a variety of tools to make data dissemination easier and more worthwhile. Authorship is clearly identified through citation tools, including web-based publication systems that enable individuals to upload their own data for review, and collaboration is facilitated through easy download and "tagging" features. Near Eastern archaeologists will benefit from Open Context's flexibility to share a variety of content from diverse projects, no matter how large or small. This article was originally published in Near Eastern Archaeology (ISSN 1094-2076), Volume 70, Number 4, December 2007. Copyright 2008 by the American Schools of Oriental Research.